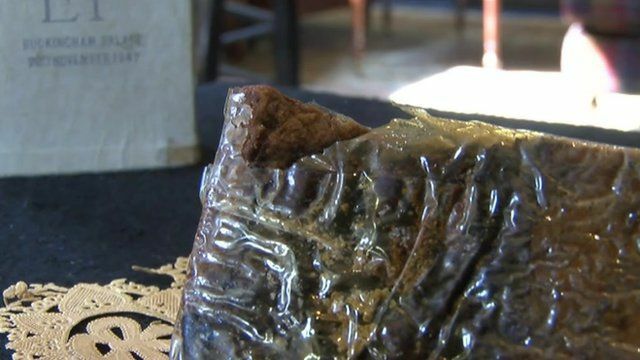 Queen's wedding cake for sale Jump to media player A slice of the Queen and Prince Philip's wedding cake is to be auctioned, nearly 68 years after the couple got married. The Queen - in cake form Jump to media player One of the more unusual tributes being planned for the Diamond Jubilee is a new portrait of the Queen - but one being made out of cakes. 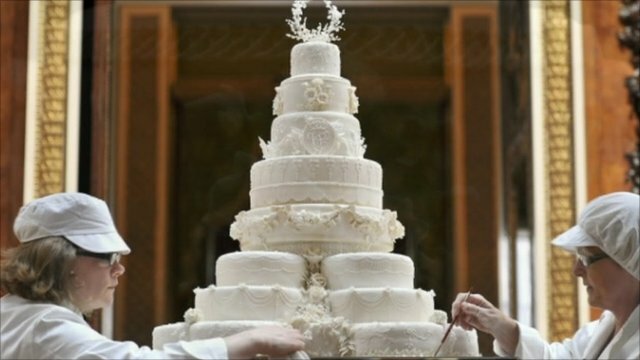 Was the royal wedding cake flawless? Jump to media player The huge royal wedding cake was made by businesswoman Fiona Cairns, who went from kitchen table baking to selling her creations to some of the country's best-known stores. A slice of the Queen and Prince Philip's wedding cake is to be auctioned, nearly 68 years after the couple got married. The slice has been kept in its original box by an unnamed woman from Hove, East Sussex, whose father attended the royal wedding on 20 November 1947. It is due to be auctioned at Gorringes in Lewes on Wednesday at 10:00 BST. The reserve price is £500.